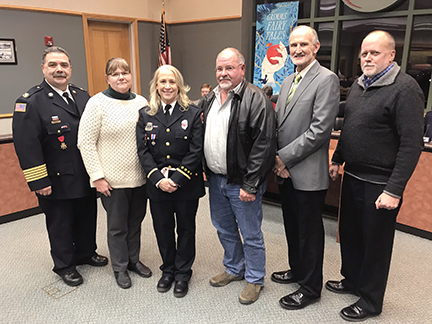 At the Westmont Village Board meeting on February 1, 2018, the Westmont Fire Department announced several promotions. Lieutenant Lynn Dralle was promoted to the rank of Captain. Lynn started in Westmont on contract in 1993. She was then hired full-time by the Village in 1997 as the EMS Director. Lynn was promoted to Lieutenant in 2003. Last year, Lynn was recognized as the recipient of the 2017 Earl J. Field Leadership Award, given annually to a member of the Good Samaritan EMS system who has exhibited dedication to the promotion of EMS excellence during their career. Also, Firefighter/Paramedic Chris Gerlich was promoted to the rank of Lieutenant. Chris was hired part-time by the Westmont Fire Department in 2008. Since 2015, Chris has served as the Westmont Fire Department’s Quartermaster, which has the responsibility of ensuring that fire personnel has the best protective clothing possible.